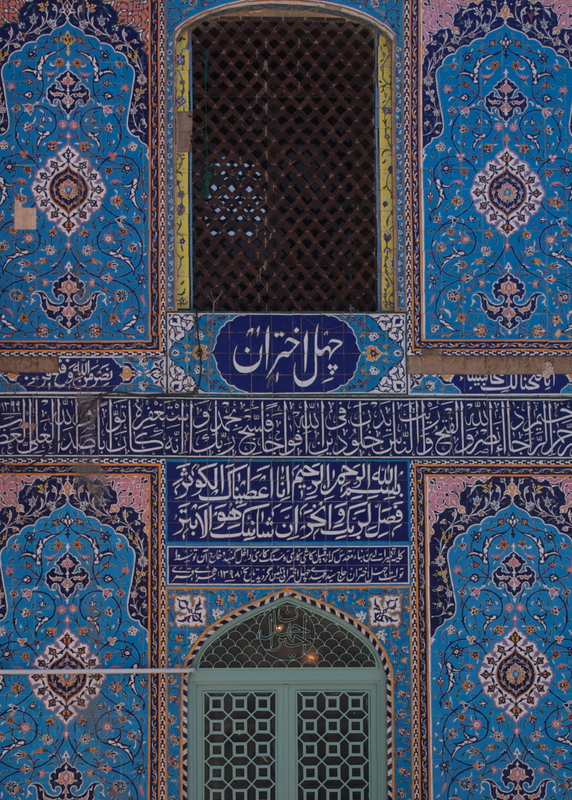 Safavid women were devotees of Fatimeh Ma'sumeh (a.s.) and donated generously to her shrine. 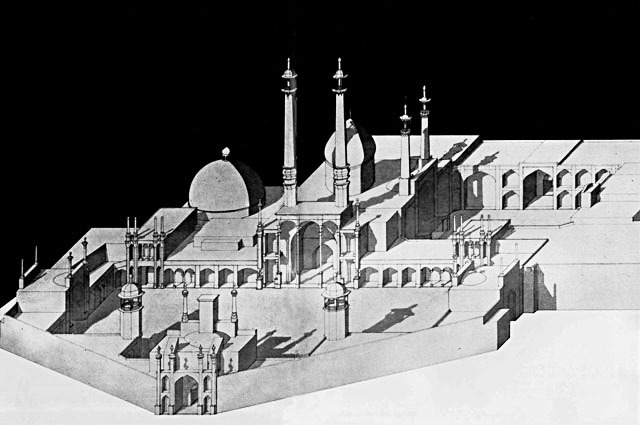 For example, Shah Ismail's wife, Tajlu Khanum, was a wealthy woman who ordered the rebuilding of the dome over the tomb. The main entrance into the Haram, the Ivan-i Tala (Golden Ivan) was built at the same time (959/1519). 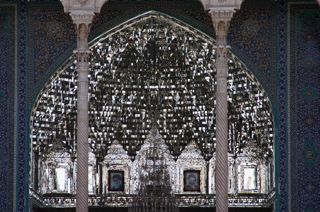 Although Shah Ismail is credited as the ruler, it may be that Tajlu Khanum had a hand in its construction, owing to her extensive wealth and properties in the region of Qum. 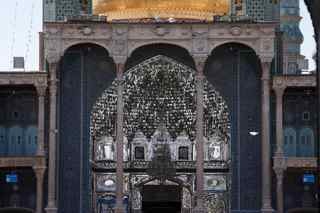 Her son Shah Tahmasp established an endowment in 1563 that included money for six huffaz to recite the Qu'ran in the name of his sister Mahin Banu. Whoever visits Masuma in Qum is like the one who has visited me. 1. Nasikh al-Tawarikh, vol. 3,p. 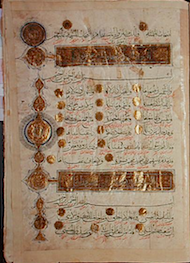 68; Rayahin al-Shari'a, vol. 5, p. 35. This guide is getting dated, but still has useful information. This is an Iranian website, in English. It seems to be under construction and at the end of 2009 there did not appear to be much information on it. 94 AH / 712-713 CE Ashari Arabs of Kufa, who had been persecuted for their beliefs established themselves in this region. 4th / 10th century Qom was described as being a prosperous town, the population was ethnically Arab, but Persian speaking. 189 / 804-5. The city gains its administrative independence from Isfahan. 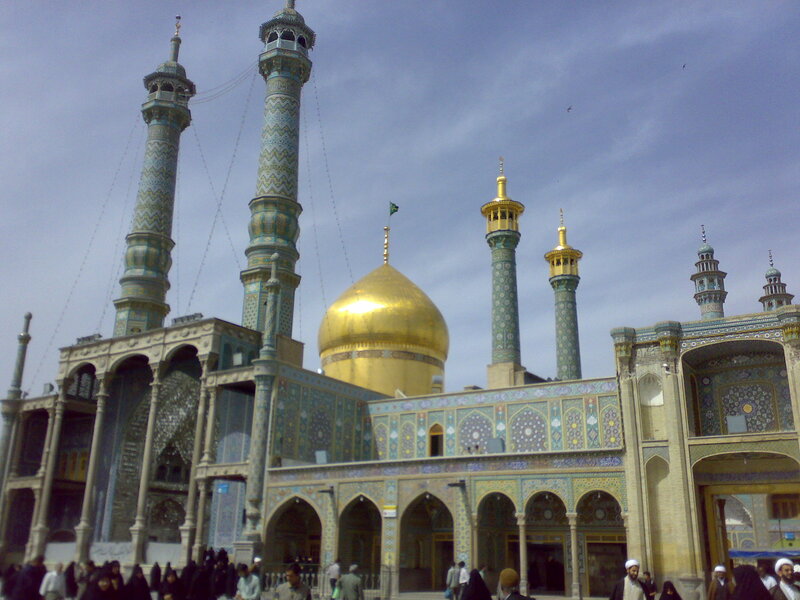 201 / 804-805 Fatima al-Masuma (a.s.) went to visit Imam Reza (a.s.), she fell ill at Sawa and asked to be taken to Qom, where she died. 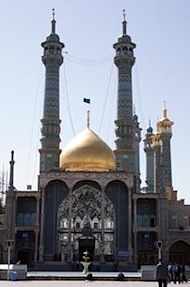 The tomb of Hazrat Fatima (a.s.) would become the centre of Qom. The city was patronised by the Buyid dynasty and the Seljuks. The city became well known for its shrine, madrasas, religious foundations, administrators and viziers and ulama and scholars. 621/1224. Inhabitants were massacred by Mongol invaders. 9th/14th century the town enjoyed royal patronage. The Turkoman sultans used it as a winter capital and this continued under the early Safavids. Shah Abbas I encouraged pilgrimage to the Shrine. 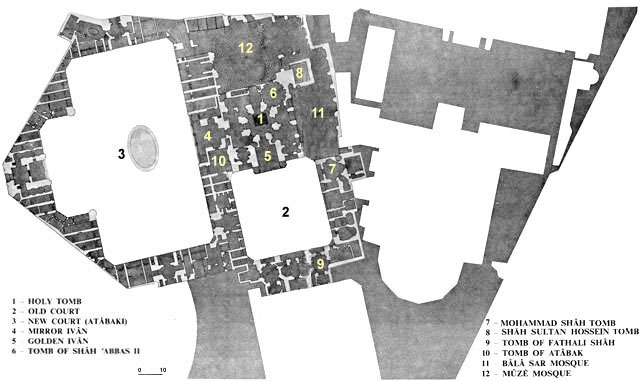 The city became an important centre for burial. 17th century the city became well known for craft products. 18th century there was an economic depression and a massacre by Ibrahim Khan (brother of Nadir Shah). The Qajar dynasty revived the building of monuments. 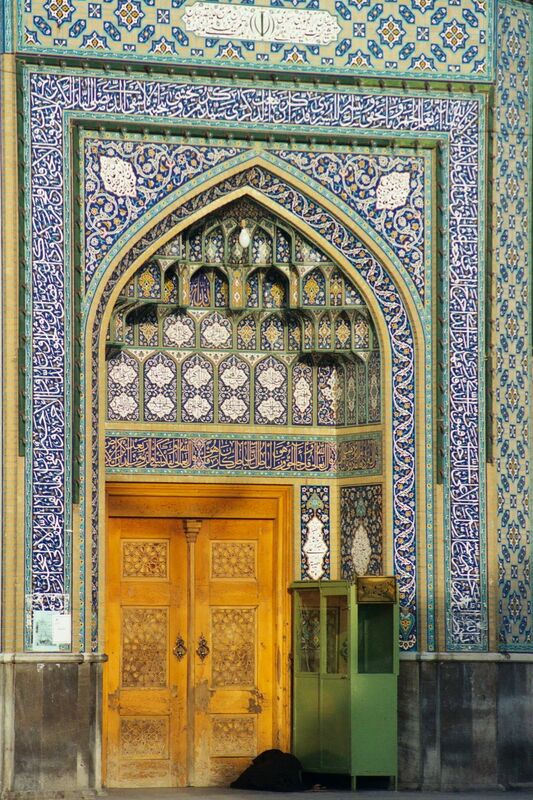 Fath Ali Shah embellished the shrine of Hazrat Fatima (a.s.) New court (sahn-i-djadid) was built by Amin al-Sultan, vizier of Nasir al-Din Shah in 1883. Around the old court (sahn-i-atik) is an octagonal monument with the tombs of senior Qajar dignitaries. 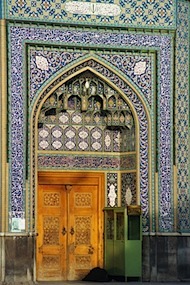 The Masjid - i - Azam, built on the orders of Ayatollah Burujurdi (d. 1961) stands to the west of the sanctuary. You may well have come across this name in a number of different publications, well there head office is in Qom and if your luggage allowance will bear it, you can pay a visit. They are on 22 Shohada St.
Sahn-e Alabiiki or the New Court is one of the finest structures in the Holy Shrine. It was built as a rectangle, but today it has lost some of its original shape. The New Court has four ivans and is one of the architectural masterpieces of Iran. The four ivans provide entrances to the court and are located on the east, west, north and south. Around the court there are thirtyone cells and small ivans. Imam Khomeini Airport (IKA) is relatively close to Qom (2-3 hours by road). Usually we drive straight to Qom from the airport. Use a prepaid/billeted taxi. Should be around £20 (US$30) for a one way fare – but it is a standard price and you should not get ripped off. A cousin of mine from India paid much less than this - I get the impression that there are different prices for developed and less developed countries. There are more Qom images here. 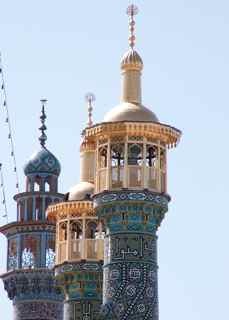 The principal shrine, holding the tomb of Fātimah (a.s.), is a gold-domed structure. Fātimah (a.s.) died in the ninth century; the shrine’s first dome was constructed in the twelfth century. Already in the medieval period, the shrine served as a bast (a place of refuge) where people could stay until a legal issue got resolved. But it wasn’t until the sixteenth century that her shrine became famous. A short description of her shrine is here. A far more detailed description is here. Pilgrims enter through a large doorway (built in 1883) to a large courtyard. Text of her ziarat is here. Qom is also close to the Masjid Jamkaran, people tend to go on Tuesday night. Getting there is easy, behind the International Hotel, at the start of the concourse to the Qom shrine is a taxi stand and you will find taxi drivers calling out 'Jamkaran'. If you are alone or a couple you can share. You will also get the benefit of paying local Iranian taxi rates! The return is trickier, but listen out for the taxi drivers calling out ‘Harram’. These drivers will drop people off by the shrine in Qom and walking back to the hotel is easy. I understand that there are also buses coming back to Qom, with Harram written on the outside. The site is fairly open and there is a fair distance from where vehicles will drop you off to the masjid itself. In spring, when I have been, it can rain, so dress appropriately. The background to the establishment of the shrine is here. 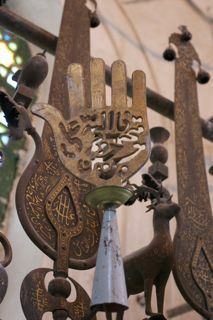 These are the prayers for people who visit the Jamkaran mosque, just outside Qom. The following link has the relevant information. 1. The holy tombs of Zaynab, Maymoona and Umm Muhammad, the daughters of Imam Muhammad at-Taqiy (al-Jawad). They have been buried beside the holy tomb of Lady Fatima al-Ma’ssooma (s). 2. The tomb of Musa al-Mubarqa’, the son of Imam Muhammad at-Taqiy (a.a.), in Chihil Akhtaran (forty stars). 3. The tomb of Shahzada Ahmad, the son of Musa al-Mubarqa’ (beside his father’s tomb). 4. The graveyard of Chihil Akhtaran (beside the shrine of Musa al-Mubarqa’). 5. Imamzada Sultan Muhammad Shareef (in Chahar Mardan Street). 6. Imamzada Hamza bin Musa (opposite to Kuhna Square in Azar Street). 7. Imamzada Ahmad bin Musa (beside Shahzada Ahmad). 8. Shahzada Ibraheem and Shahzada Muhammad, grandsons of Imam Musa al-Kadhim (s) (in Shahzada Ibraheem Street). 9. Imamzada Ahmad bin Qassim (at the end of Mu’allim Street). 10. Shahzada Sayyid Ali (at the end of Bajak Street, near Jihad Square). 11. 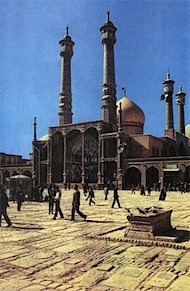 Imamzada Sayyid Sarbakhsh (in Azar Street after Kuhna Square-opposite to Chihil Akhtaran). 12. Shahzada Nasir, one of Imam Hasan’s grandsons (opposite to Imam Hasan Askari Mosque). 13. Chahar (four) Imamzada, Imam Zaynulaabideen’s grandsons (at the end of Bajak Street). 14. 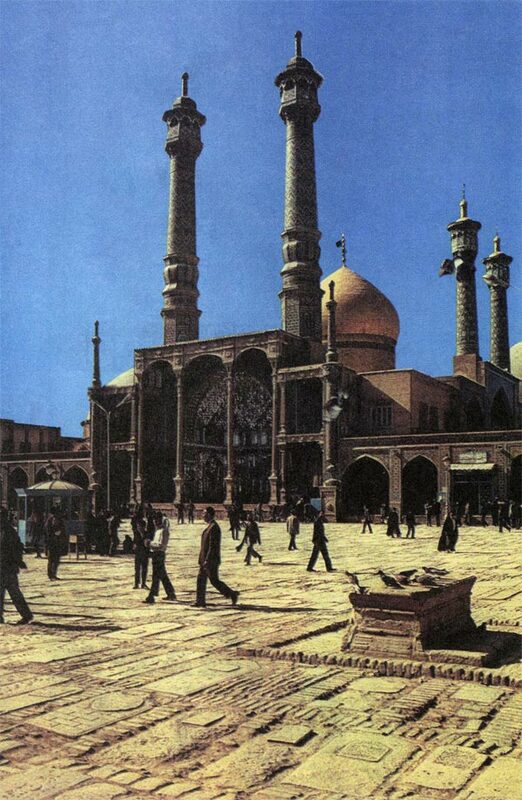 Imamzada Khak Faraj (at the end of Imam Musa as-Sadr Street-Khak Faraj Quarter). 15. Imamzada Shah Jamal (Arak Highway, near Salarya). 16. 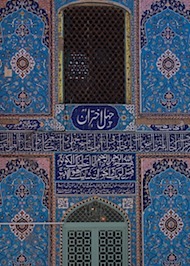 Imamzada Abu Ahmad, one of Muhammad bin al-Hanafiyya’s grandsons (between Shah Sayyid Ali and Chahar Imamzada-15 Khurdad Street). 17. Imamzada Ali bin Ja’far (at the end of Chahar Mardan Street-near Golzar Shuhada’). 18. Shahzada Hadi and Shahzada Mahdi (in Jamkaran). 19. Imamzada Tayyib and Imamzada Tahir (on the side of Qom-Saraja Highway). 20. Shahzada Ja’far Ghareeb (Jamkaran crossroad- near Baqee’ Graveyard). 21. Imamzada Zayd (opposite to the tomb of Musa al-Mubarqa’). 22. The tombs of Bagh Gombad Sabz-the garden of the green dome (tombs of the walis of Qom from the dynasty of Ali as-Safiy- opposite to the shrine of Ali bin Ja’far).